Automotive Robotics Market size valued at over USD 4 billion in 2016 and will surpass 210,000 units by 2024. Rising advancements in multi-functional robotics results in fast production cycles. This technology substitutes the human labors for carrying out hazardous and repetitive tasks performed in the work space. It is widely deployed in automotive industry to maintain the consistency and high precision in assembling work for better productivity. In 2016, the automotive industry accounted for over 46% of the global industrial robots’ demand spurred by pervasiveness of IIoT (Industrial Internet of Things) and rising digitization in manufacturing plants. OEMs and subcontractors are also acknowledging the need for the product owing to digital & virtual factories, 3D printing, and flexible manufacturing. Manufacturers are adopting the technology for several reasons such as capacity, safety, and quality. It helps in minimizing the waste caused by human errors leading to the lesser variability in vehicle assembly. Auto makers are striving to maintain consistent time and control processes in each stage of the assembly line. Vehicle manufacturing process comprises of insidious tasks which lead to musculoskeletal disorders resulting from twisting, lifting, and repetitive movements. This prevent human risks by keeping laborers away from the exposure to welding and paint fumes which will augment the global automotive robotics market share over the forecast timeline. High installation cost will hamper the overall revenue over the forecast timeline. Uncertainty related to stored data from the product will restrict the industry as information contained in databases can lead to unlawful access or misuse. Moreover, rising unemployment due to automation will act as a restraint to the industry size. Articulated robot market size will account for over 35% share by 2024 owing to its increase usage in material handling, welding, material removal and dispensing. They have usually four to six axes but with advanced technologies and development it may have up to ten axes, making them more versatile. This in turn, enhances company’s productivity via improved accuracy and speed. These products are shrinking in terms of prices owing to its longer life shelf. High adoption rate of SCARA are expected owing to handling and high-speed assembly operations. Increased output and reduced bottlenecks will result in acceptation of SCARA robots over the projected timeline. Micro-manufacturing automation is a key contributing factor driving the parallel robot industry over the estimated time frame. Innovations in these products have opened growth prospects for multiple end-user. Software & services segment in the automotive robotics market is expected to grow and hold at over 27% market share by 2024. Developments such as cloud based platform, will propel the industry share over the forecast time frame. Some of the key market players provide an open software platform for enabling the advanced analytics and learning capabilities, CNCs, sensors, and peripheral devices used in the systems. Software loaded into the computing hardware enables data access from PLC, machine tool device, and apply analytics in real time to take immediate action. Proper running of software eliminates risk of production downtime. These advancements will spur the industry demand by 2024. Increasing advancements in hardware components, such as controllers, arms, end effectors, drives, and sensors, will drive the hardware industry growth in the future. Global automotive robotics hardware components generate USD 3 billion revenue in 2016. Increasing adoption of small-sized controllers by various OEMs is an emerging trend, which is gaining prominence in the market. Controller is a commonly used hardware in the manufacturing process owing to its regular functionalities and technological advancements in the industry. It holds more than 25% of the overall automotive robotics hardware market in 2015. High adoption rate of the arms is observed in several jobs that are more repetitive and causes fatigue to human labors. Light weight model, easy deployment, and compact structures will augment the robotic arms industry growth rate. Extensive use of robots in several applications such as spot welding, arc welding, painting, assembly, and processing in the automobile industry, is responsible for high profit margins and less production time for the organizations. The reduction in product prices and the availability of several associated tools make the task easier along with maintenance consistency. Slim robots are designed to reduce the overall machine footprint and conserve the floor space, which will enhance the market potential over the upcoming years. Handling operations is anticipated to showcase a significant growth at over 5.5% by 2024 owing to its increasing installation in the vehicle manufacturing plants. Advancements in software, vision, and gripper technology will facilitate handling operations. The product is required to lift heavy materials in bulk quantities and transfer partially assembled vehicles from one assembly line to another for its further processing. The robotic assembly market holds more than 15% of the total industry share in 2016. Increased powertrain and body-in-white assembly application has further enhanced the scope of automotive robotics market penetration. Almost 90% of automated operations are done by the machine in final assembly. China market has increased drastically in past two to three years owing to increasing Automobile-4.0-Robotics program covering hydronics, packaging machinery, welding, process equipment, SPS IPC drives, and fluid power. Asia Pacific is considered as the biggest revenue contributor and is more than USD 1.9 billion in 2016. 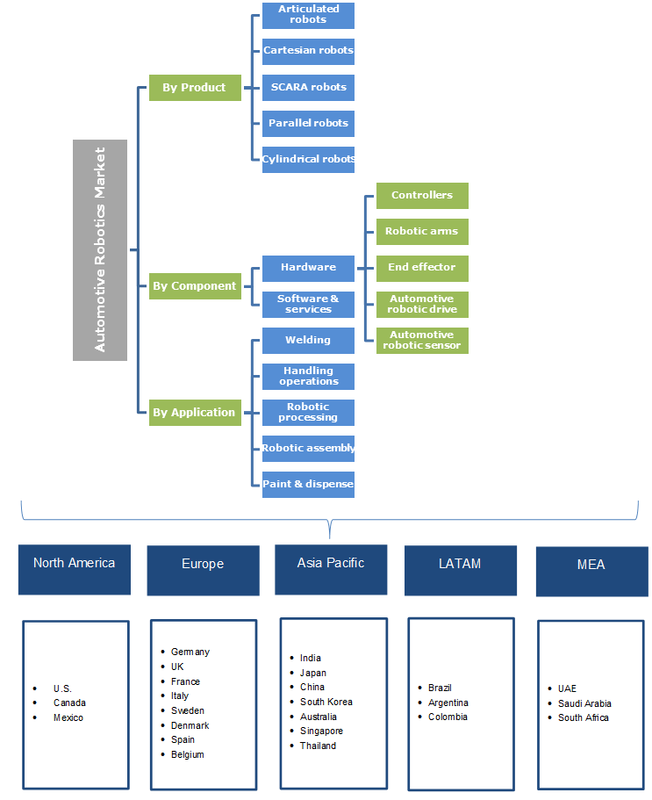 North America automotive robotics market was over USD 1 billion in 2016 owing to automation, modernization, and robotization as the primary investments for OEMs. Competitive advantage and reduced per hour cost as compared to human results will augment the regional industry growth. However, product innovation is forcing the government to enforce laws for human workers as the labors are getting replaced with machines and software will hamper the product market size. Europe, led by Germany and Italy market is anticipated to exhibit a significant share of about 25% in 2016 owing to wide presence of strong automobile industry foothold in the region. In addition, retrieval from economic recession in Germany, Belgium, Netherlands, Austria, Spain and Finland will fuel the European automobile industry, further propelling the product growth. The key industry participants in the automotive robotics market are KUKA, ABB, FANUC, Rockwell, Kawasaki Heavy Industries and Yaskawa. Other industry participants are Comau, Denso Wave, Omron Corporation, and Universal Robots. The industry is characterized by the presence of a few international and several local players competing to increase the market share. Few SMEs are underpenetrated as they don’t observe any value in installing the products unless they get repeat orders and volume business. Moreover, they lack skilled resources and capital for the product operation. They can be persuaded to install the product through cost saving demonstrations in near future. Major players such as KUKA, FANUC are immensely concentrating on their research activities to develop innovative products and eliminate its technological glitches. Moreover, the players are involved in strategic partnerships with the automobile vendors to provide product software upgradation and services by maintaining long term relationship. In addition, the industry players of market are focusing on business expansion by collaborating with other vendors and investing in research & development activities to deploy next generation technologies in will enhance its efficiency. For instance, in July 2017, Comau collaborated with NIMAC Group. In April 2015, Denso Wave partnership with Matrox Imaging and in March 2015, Fanuc and Nvidia collaborated for enhancing its product efficiency. The automotive robotics industry is categorized by the presence of various players globally competing to increase their market share. Technological innovations and collaborations with automobile OEMs and raw material suppliers are the focus area of these companies. Long term partnership with automobile OEM will serve the organization with regular maintenance facility and software upgradation. Players in the industry can be system integrators, distributors, and manufacturers. The competition is intense owing to bulk demand from the automobile OEMs and customized product requirements. The systems integrators and VARs (value added retailors) play key role in providing customized solutions to the customers. Increasing new product launches the cost of these systems is expected to decrease substantially in the forecast timeframe. Global investment in robot technology in the automobile sector is increasing year on year. Return on investment concerns for SMEs and eager adoption of the product in developing countries will force the product manufacturers to continuously launch production systems and innovate products that are robust, flexible, cost effective, and reliable.